Home entertainment has come a long way from the days the family sat huddled around a television and VCR watching rented movies. Today’s home theaters and media rooms incorporate special lighting, room-darkening curtains and acoustical wall coverings that enhance the surround sound for a true cinematic experience. Reclining chairs and cozy couches assure that the comforts of home are included. 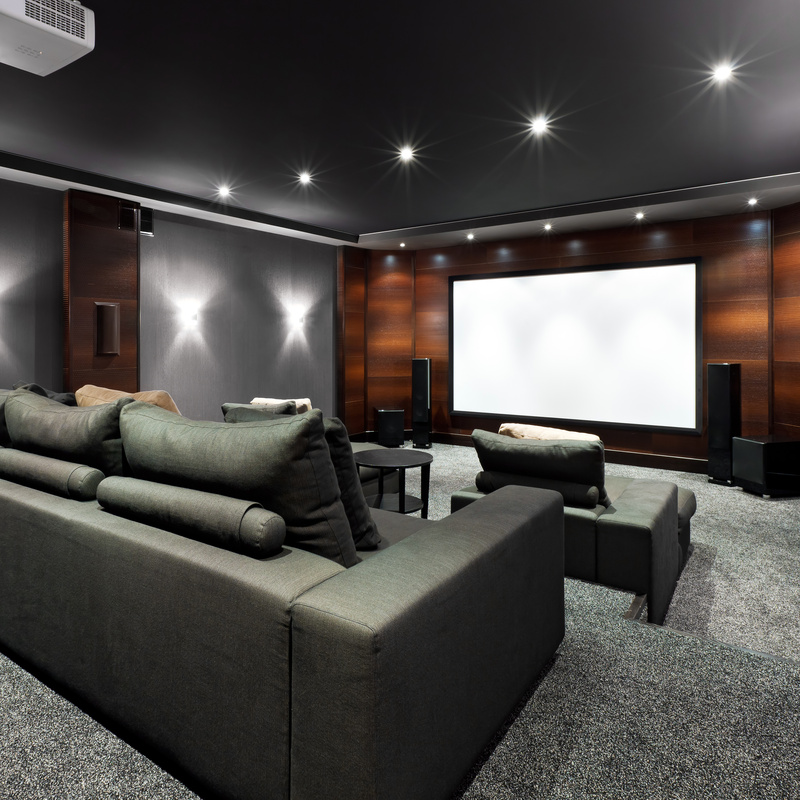 Today’s upscale homeowners often plan for a specially dedicated home theater or media room to be included in the blueprints of their new homes. 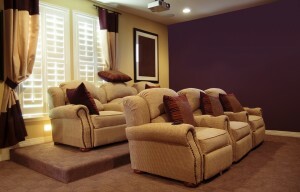 However, older homes can have rooms specially re-purposed as home theaters with some modifications and refurbishments. The first step is to decide whether a dedicated home theater area or multipurpose media room best fits the lifestyle of your family. Basements, attics, bonus rooms or spare rooms are great as dedicated home theater spaces, designed specifically for enjoying movies, sports, TV and video gaming. A media room serves a similar entertainment purpose, but usually doubles as a multipurpose living space where the family frequently gathers. Basements are often the first choice for home theater locations due to their subterranean nature and natural darkness, but virtually any room in the home can be re-purposed with the right accessories and design options. Comfort is key, so any home theater should have features like plush sofas and recliners, throw pillows, soft blankets and recessed lighting with remote dimmer switches for ease of operation. If there is sufficient room, a two- or three-tiered seating area can be designed using carpet-covered wooden platforms. Regardless of the location of your home theater or media room, you will likely need to select specially designed curtains to block out intrusive lighting that can affect the viewing experience. Room-darkening shades can be used in conjunction with blackout curtains if this is a room that gets a good bit of natural light. Drapes or curtains can also be used to conceal a large projection screen that opens dramatically at the beginning of the movie. Walls can be covered in fabrics both for acoustical and aesthetic purposes. 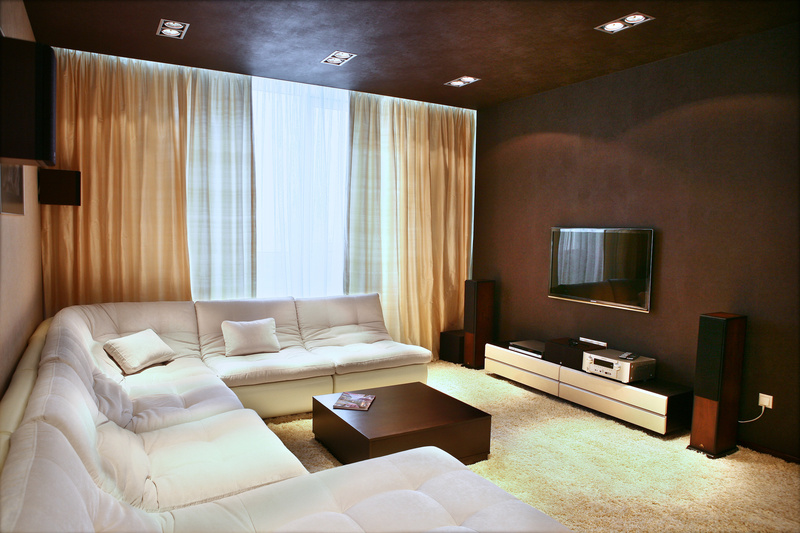 Dark walls and ceilings with light colored carpeting can make an area appear more spacious while simultaneously optimizing the viewing. Neither drywall nor plaster will result in the kind of acoustics expected in a home theater setting. Acoustical panels can be covered in materials coordinated to blend into your décor. Carpeting over bare floors is mandatory to improve the acoustics in the room. There is a sub-specialty of home interior design that focuses solely on home theaters and media rooms because of the technical nature of the theater components. 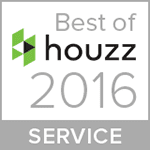 However, these professionals are usually neither decorators nor designers in the truest sense. While their input is valued, to get the most visually appealing home theater, an interior design consult will be necessary. Curtains Boutique can suggest various themes and accessories for the room, such as framed classic movie posters, a working popcorn machine, old-school pinball machines and video games. They understand how to remain within pre-set budgetary limits and have access to many special resources the average DIY consumer does not. When planning your media room or home theater, first schedule a personal, in-home consultation with us at your convenience to guarantee the best results for your project.